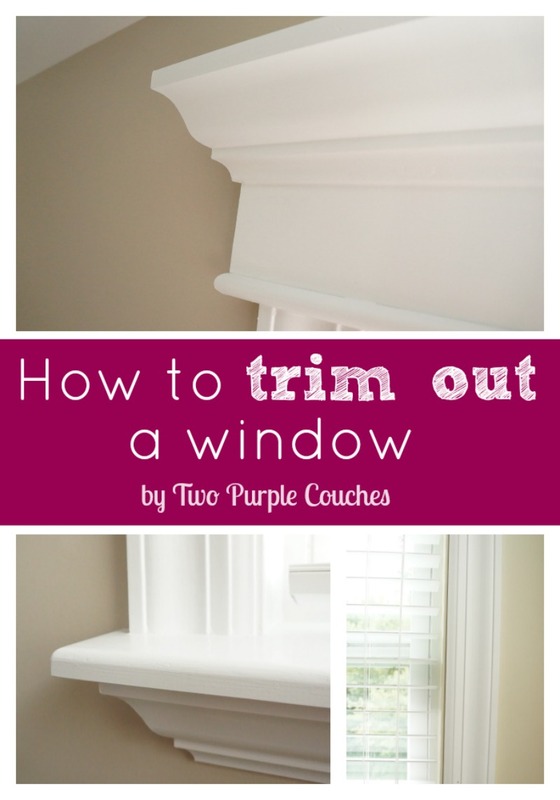 Window trim is a simple DIY home improvement project that makes a big impact. Create a custom, high-end look by installing interior trim and moulding. 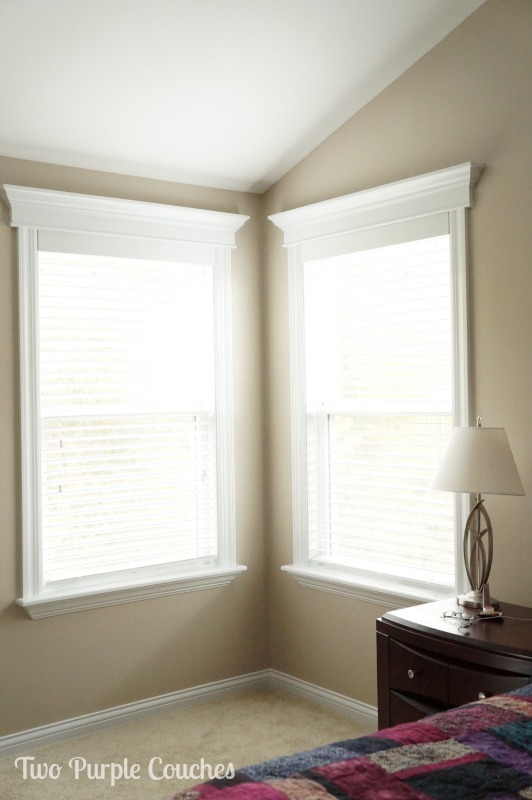 Window trim is one of our favorite ways to upgrade our home. 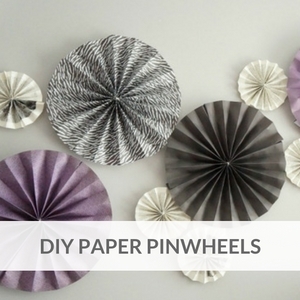 It might be one of the simplest DIY projects you can do to add some punch and pizzaz to your space. 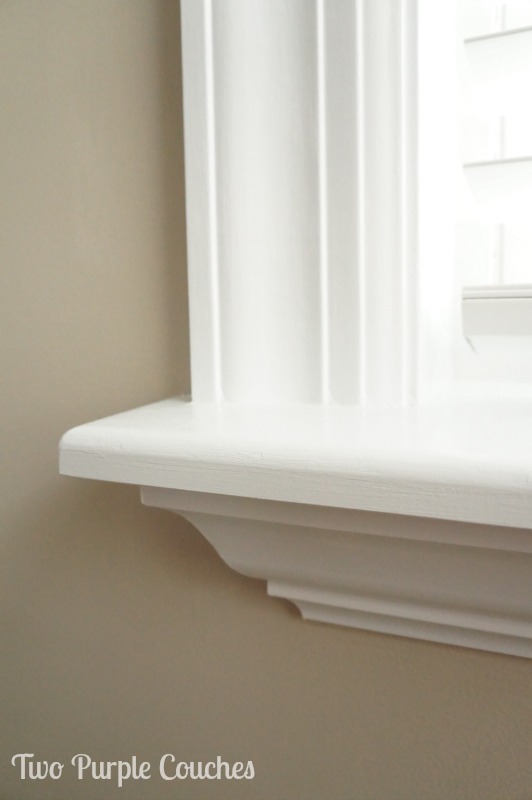 There are many ways you can customize window trim and moulding to suit your style and your home’s architecture. We combined different trim and crown pieces to achieve a very custom look in our bedroom. Installing window trim isn’t a complicated home improvement project, but if it’s one of your first, it may feel a bit intimidating. Once you have your measurements figured out, it’s pretty straightforward from there. It can be time-consuming, as evidenced by the fact that this project took us about a month to complete. We take “measure twice, cut once” very seriously around here! It’s all worth it in the end, though! 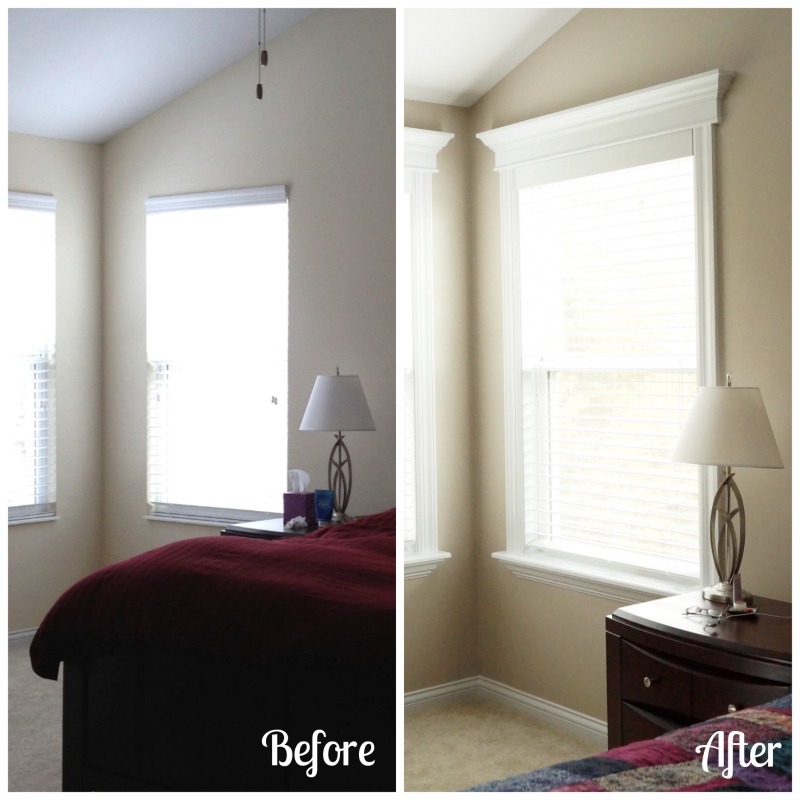 For our master bedroom windows, we decided to go bigger and bolder than we did with the window trim around our family room and dining room windows. I wanted to channel a fancy Victorian look and Tom wanted to flex his craftsman muscles and design us a custom look. And I think he did a fan-freaking-tastic job! Want to see how we did it? 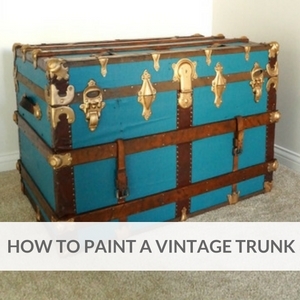 Read on for the full step-by-step tutorial. This post contains some affiliate links for your convenience. Click here to read my full disclosure policy. Step 1: Install the top trim pieces first. This could be a single piece of trim or, if you want to create a more custom look like we went for, a 1″x6″ board of pine or poplar. There are a few benefits to using a 1″x6″ board like this at the top: 1) you can add on multiple pieces of trim to get that custom look and 2) you don’t need to miter the edges! Just a nice straight cut will do. Measure for the length of the window and make the cuts. Using a brad nailer makes this project go much faster. We used our Hitachi Air Compressor and Brad Nailer, and they pretty much became our best friends throughout this project! Step 2: Measure and install each side piece of trim. We selected a 4″ piece of pine trim for the sides of our windows. Measure for the length of each side, make the cuts, and install with that handy dandy nail compressor. 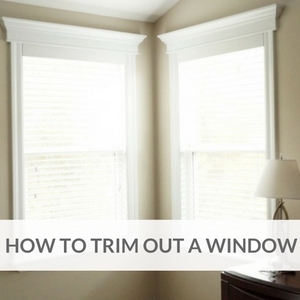 If you selected a single piece of trim for the top of your windows, you can jump to Step 5. Oooh, this is becoming a sort of Choose Your Own Trim Adventure! Step 3: Add crown / additional trim pieces. We used crown and half-round. We installed the crown at the top of the boards first, followed by the half-round at the base. Here’s a tip that Tom picked up as we were working: if you’re capping the edges of crown, like we did at the tops of each window and under each sill (which you’ll see in the next step), glue all of the pieces together and allow to dry completely before nailing to the boards. We love Titebond Original Wood Glue for our woodworking projects. This way, you can get each joint matched up as perfectly as possible, and there are fewer gaps to fill with caulk later. Once we had the joints matched up, we used some strips of ScotchBlue Painter’s Tape, to hold the sections of trim together while the glue dried. Step 4: Add crown beneath the window sill. This is kind of an optional step as well, buuuut… why would you want to skip it? Adding crown beneath a window sill looks ahhhhmazing! And definitely gives off that fancy Victorian vibe I love! We followed the same steps as above, cutting and glueing the crown pieces together before installing them with our nail gun. Step 5: Putty nail holes and caulk seams. Before you start this portion, give yourselves a pat on the back or grab a cold one, because the hardest part is over and this step is the start of the light at the end of the tunnel! Select a good wood putty to patch up those nail holes, as well as any other nicks or gaps. We like Elmer’s Color Change Wood Filler– this one is nice because it goes on purple and dries white, so you know when it’s ready to sand and paint. Sand any patched spots with sandpaper and lightly go over all of the trim as well. Caulk all of the seams with a good acrylic caulk—we used DAP Alex Flex. If you’ve never used caulk before, it’s simple, but a bit messy. 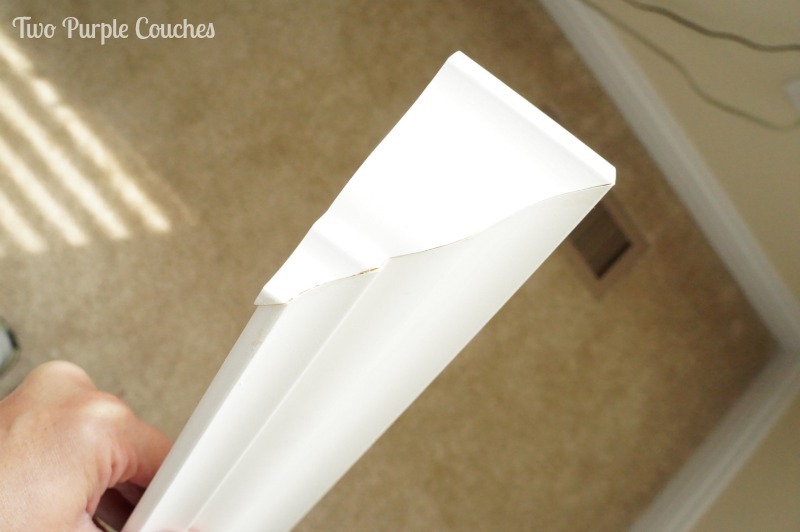 Apply a bead of caulk to the seam (where the trims meet each other or the wall), then run your finger over it to smooth it down and evenly fill in gaps. 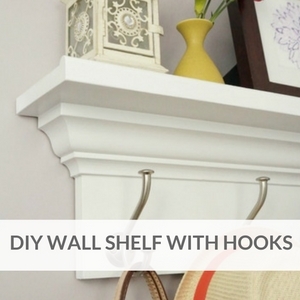 You want to caulk all of the wood joints, as well as wherever any wood meets the wall. Once the caulk has dried, it’s nearly impossible to sand down, so be sure to get everything nice and smooth before it dries! Step 6: Paint all trim to match existing baseboards, crown, etc. A painting pro (i.e. Tom’s uncle) gave us this expert tip: If you’re updating the wall color at the same time you’re installing window trim, as we were, paint the walls first. Why? 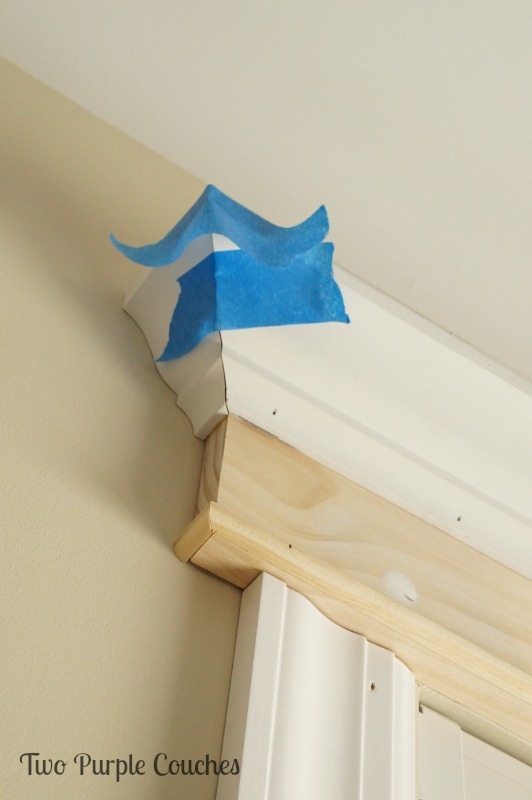 Because if you get wall paint on the trim as you’re cutting in or rolling, it’s a lot easier to just go over the trim with a fresh coat than it is to try to wash off splatters. 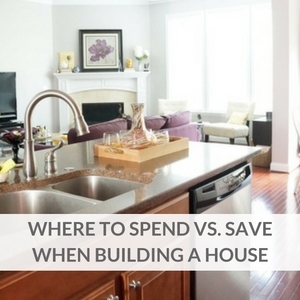 Especially if the paints are different finishes, like an eggshell vs. a semi-gloss. Note: I’ve had a few questions about how we covered the blind mount at the top of the blinds. We used 1/4″-thick poplar, painted to match the trim. To secure it, we glued magnets to the back so it can easily snap onto (and be removed from) the metal blind mount. 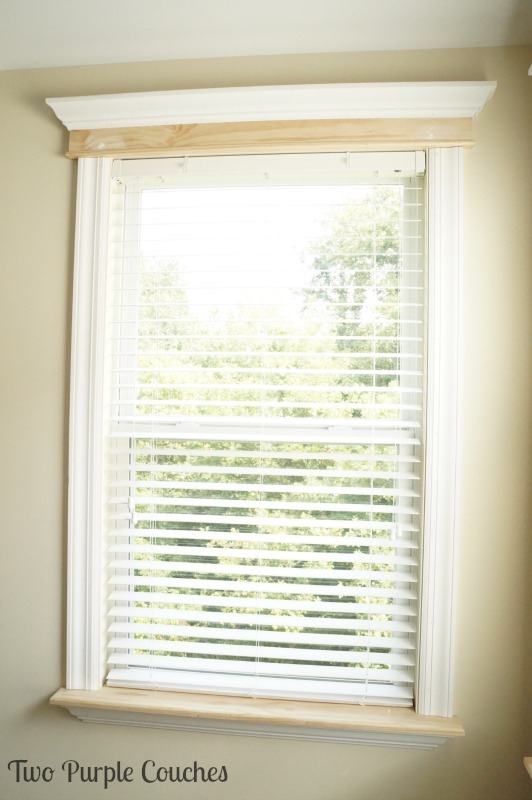 So, to recap… with a bit of time, a tape measure, a miter saw, and a nail gun, you can take your windows from blah to brilliant and give them an impressive custom look! While we were working on the window trim, we also upgraded our interior window sills to new wood ones. 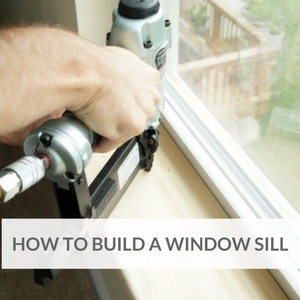 Click here to see how we replaced our window sills. 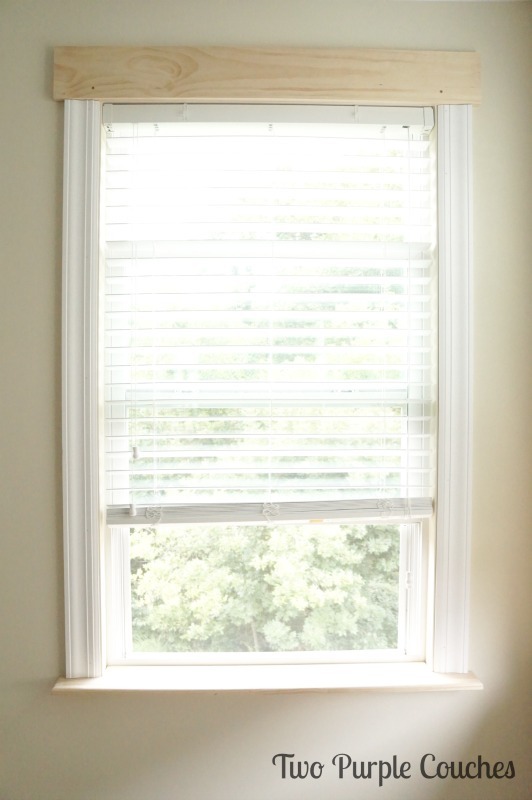 All-in-all, we added window trim to three windows in our bedroom and two in our bathroom. Though our bathroom windows have stalled at Step 5. We’ve got other visions for our bathroom, including framing our vanity mirrors and replacing the light fixtures, so that project is going to take a little longer to complete. You’re also getting a peek at some of the other updates we’re making to our master bedroom. Click here to see my bedroom design and mood boards. 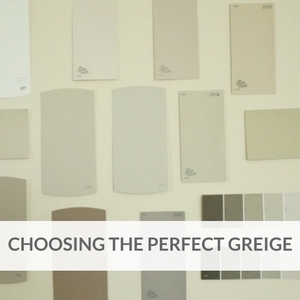 Click here to see what color we chose for our bedroom walls. This entry was posted in Around the House, Made It Myself on October 16, 2014 by Two Purple Couches. Emily, these look stellar!! I love how much more prominent it makes the windows! Thank you so much, Jenna!! Love this, and it’s something I’ve been meaning to do! Thanks for sharing! Found you via Share it Sunday! Have a great week! Mrs Major Hoff recently posted…How to design a Pumpkin Monster using a popcorn box! Thank you!! It’s amazing what some trim can do for a room! Thanks for stopping by 🙂 Hope you have a great week, too! What type of wood did you us to cover the top of the blinds? Hi Diane, it’s a piece of 1/4″-thick poplar. We painted it the same color as the trim and glued magnets to the back so we could easily snap it over the metal strip above our blinds. Thank you! And you’re welcome 🙂 If you trim out your own windows, I’d love to see a picture of how they turn out! Hi! Did you paint the small area between the window and the trim white (the inside little walls)? Hi Sarah! Yes, we painted that strip of wall with the same paint as the trim. This is a great tutorial. I have a window I’d like to do this with. It looks like there is a piece that hides the blind mount at the top underneath the top trim. What did you use to do that and how is it secured? I’d like to hide it as well, but I don’t know how. Especially since it needs to be removable in case I have to replace the blinds someday. Thanks! Thank you, Sam! We used 1/4″-thick poplar to cover the blind mount. We painted it the same color as the trim and glued magnets to the back so we could easily snap it over the metal strip above our blinds. 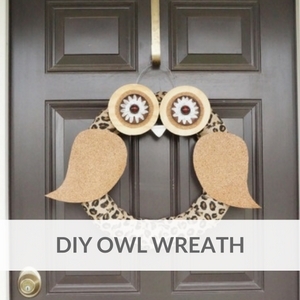 Ok, this is something that I am certain I will be doing when we move later this year! Wow, what a transformation! Thanks for the great tutorial….so pinning this!! Christine | Where The Smiles Have Been recently posted…Patriotic USA Map Wooden Door Hanger: Perfect for Memorial Day and Fourth of July! Thanks Christine! It’s amazing how much of a difference it makes! Your windows speak a soft whisper of elegant chic. 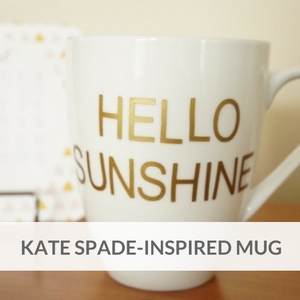 An Outstanding statement for your room! This is JUST what I have been looking for. The precious rescue we adopted 9 years ago chewed the edges off all four kitchen windows. So I love the idea of putting this new sill on top and covering the older one with crown molding underneath. 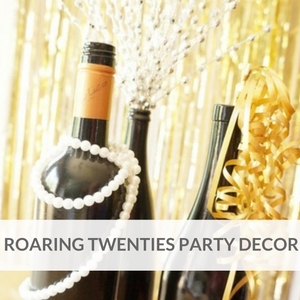 Just wish I had read this before this weekend when I repainted the kitchen – I probably would have taken down the curtain valances entirely if I had added those gorgeous top moldings. Beautiful work – excuse me now while I check out your site to see what else I can add to my ‘home refresh’ week. This is a great tutorial! Did you have to remove the bottom window seal in order to replace with a longer one? If so, how hard was that? This is the part I am scared to tackle! Thank you Stephanie! Since we were adding the decorative trim underneath the sill, we did not remove the old one first. We glued the new sill to the old one and secured it with a few nails. We’ve since updated some other rooms in our home and have removed the old sill (ours are a plastic type of material). To do so, we scored underneath them with a utility and carefully pried them up, working in small sections until the whole piece was loose enough to remove. We were nervous to remove them, but we worked slowly and they came up without much trouble! I loooooove the crown molding you chose. Do you by chance have a link or a description so I could see if it’s available in my local area? Thanks so much Katy! I apologize but I don’t remember the exact type of molding we chose. I believe it was between 3″ and 4″-inch crown. We purchased different pieces from both Lowes and Home Depot to create our whole window look, but I did a quick check at Lowes and this one looks somewhat similar: https://www.lowes.com/pd/8-Pack-3-25-in-x-12-ft-Pine-Primed-Crown-Moulding/3441572 I hope this helps! This exactly what I was looking for, thank you so much for this!! You have done an amazing job on your house, it looks very elegant! So we just recently bought our house and currently finishing all the crown mouldings. My door came with door trims but my windows only have traditional sill. Im thinking to upgrade it and put trims around but im having hard time looking for the same trims to match my doors. I wanted everything to match. I came to see your article and on your picture i noticed we have the same trims! Im hoping you can help me find where you got them and whats its name/brand/model. Id appreciate any help thank you! 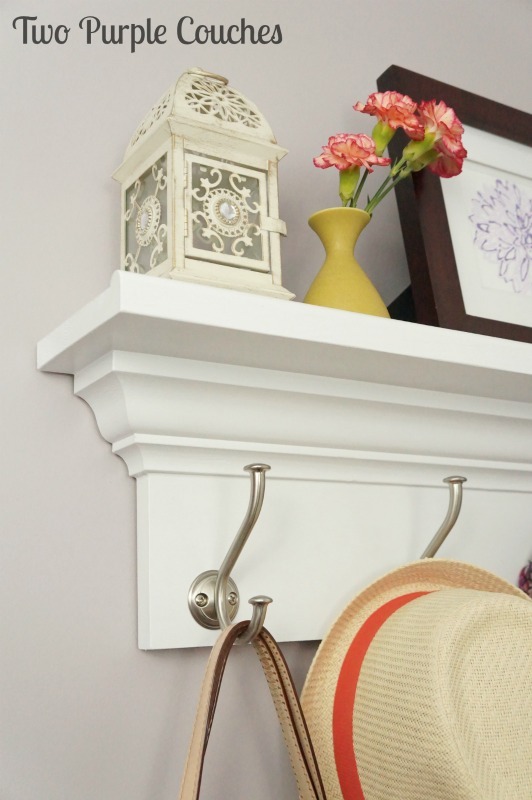 It can be tricky to find trim that’s an exact match, or at least a close match. Ours are not identical, but they work well together. I’d suggest measuring your door trim and bringing a photograph of it along when you’re shopping for the window trims – this is what we did so that we could find one that complemented our door trim. We shopped our local big box hardware stores (Lowes and Home Depot) to find all of the pieces we need. Our trim pieces on the sides of the windows are 4-inches. I don’t have any specific model numbers or details, but I know our trim pieces are 4-inches wide. I think the sizes all depend on what your local stores carry. I hope this helps! I bet your windows will look fantastic no matter what kind of mouldings you find! Emily, I’m wowed! Pinning this for future reference, but I don’t know … would rather hire you! I was glad to learn that installing window trim isn’t that complicated. Will save this in bookmarks! 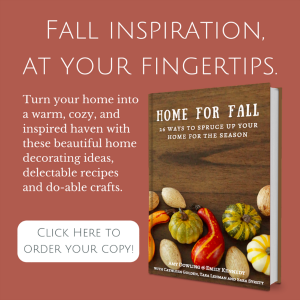 I'm a Cincinnati gal on a mission to infuse color and personality into our home through crafts, DIY and decorating projects. 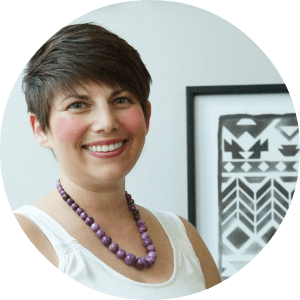 I am passionate about sharing creativity, discovering new skills and inspiring others with do-able DIYs. When I'm not working away in my craft room, you'll find me sipping lattes and reading novels (probably by Jane Austen). Thank you for your interest in Two Purple Couches and the work I share. All of the work contained on this site is copyrighted, however bloggers are permitted to use one original image, with watermark, along with a brief description and a direct link back to the appropriate post. Posts may not be excerpted or reproduced in their entirety, and photographs may not be edited or altered. This permission may be revoked at any time upon written notice from me. If you are not a blogger and wish to use the work contained on this site in a manner other than what is expressly permitted here, or have any other questions, please contact me at hello@twopurplecouches.com. As it relates to comments and content posted on this blog by those other than the author, any such content that contains the copyrighted and/or proprietary work of others is expressly prohibited and will be removed. Repeated posting of such content by the same user will result in that use being banned from this site.